The Magellan Meridian Platinum features a 3-axis electronic compass that provides valid readings regardless of how you hold the unit. A built-in barometer gives you advance notice on the weather, and a 16 MB, built-in mapping database shows your position to within 3 meters. The map database includes highways, major roads, parks, waterways, airports, and cities. The Meridian Platinum has eight navigation screens: Map, Compass, Large Data, Position, Road, Data, Speedometer, and a Satellite Status screen. The Map screen has two modes, position or cursor. In the position mode, your present position is indicated by the large arrow icon in the center of the display. If you are moving, the arrow will point in the direction that you are heading. At the bottom of the screen is the scale for the map displayed and two data fields that can be customized, or turned off. In the Cursor mode, you are provided with a cursor that can be moved on the map. At the bottom of the display is the information for the position of the cursor relative to your present position. The Compass screen is customizable to display the information that is useful to you. The lower portion of the Compass screen not only displays your heading in a graphical manner, but also displays the relationship of the sun, moon and your destination to your heading. The Large Data screen is similar to the Compass screen but here the compass has been removed to allow for large display of the navigation data. This is ideal for when you need to use the receiver mounted on the dash of your car or boat. The display can be seen from a distance. The Position screens 1 and 2 display your present position using the coordinate systems that you select. These screens show all of the basic position, time and satellite information. They also show the current navigation information at the bottom of the screen. The Road screen presents your route as if you were traveling on a road. When you need to make a turn, the road will graphically display the turn and the direction. Waypoint and destination icons will be displayed relative to your position as they come into view. Above the road is a compass that displays your heading and above that are four customizable data fields. The Data screen provides you with six data fields and an active compass that is the same as the one used on the road screen. You have the option of customizing this screen by selecting what data is displayed in the upper six fields. The Speedometer screen displays your speed in a familiar graphical format. There are four additional data fields at the top of the display that can be customized to display the data that you need. The bottom of the screen contains a trip odometer that will record the distance traveled since the last time the odometer was reset. The Satellite Status screen provides you with a graphical display of the satellites in view and which ones are being used to compute the navigation data. The bar graph shows you the relative signal strength being received for each satellite. At the bottom of the display is an indication of the battery life remaining. When marking waypoints you can select its icon, name, and add a message. With the ï¿½Gotoï¿½ feature you select a waypoint that was saved and the receiver guides you to that point. ï¿½Backtrackï¿½ allows you to retrace your steps back to your starting point. An extra feature the Magellan Meridian Platinum has is “Weather.” You can display the current temperature and barometric pressure and barometric pressure history over the last 24 hours. The Magellan Meridian Color is a fairly large-sized receiver but relatively light for its size. The nine buttons on the face of the unit are larger than those of many other GPS receivers and therefore easy to use. It is rather broad to accommodate the batteries (which are situated horizontally), large screen, and Quadrifilar Helix antenna. As with most devices that have a great variety of options, navigating through all the menus takes some getting used to. The sides and most of the back are covered in rubber to give it a good grip both in your hand and on the console or dash of your car. The battery cover is quite secure, but still allows easy access to the batteries. A minor inconvenience is attaching the PC cable. It requires tedious manipulation to align the screw to its threaded port and then you have to twist a small “D” ring few times (plus the wrist strap must be removed first, as it uses the same port as the PC cable retainer). TTFF out of the box was 35 seconds. Subsequent cold starts were about 32 seconds. At walking speed, the estimated position error was usually about 40 – 60 feet unless it was receiving WAAS. According to the specs, WAAS accuracy is less than 3 meters (10 feet). Marking and naming waypoints was relatively simple and the Meridian Platinum offers 42 different icons to represent waypoints. I found the compass jumps around at speeds under 6-10 MPH. Standing still or moving above 10 MPH gave a more steady compass reading, albeit not totally accurate. 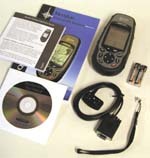 The ï¿½Gotoï¿½ feature is fundamental to a GPS receiver. After reaching the most distant point of my walk, and enabling ï¿½Goto,ï¿½ the screen displayed the direction I needed to go to reach my starting point. As I followed the indicated direction, the time to arrival and distance is also displayed. The distance is shown in miles down to one-tenth of a mile, then switches to feet. Upon arriving at my starting point, the distance remaining was off by about 30 feet. Enabling the “Backtrack” feature allows you to retrace your steps. Just choose “Backtrack” from the menu and the unit will point you in the direction of a series of backtrack points, counting down the distance to each successive point. These points are set by the receiver automatically along the route you are traveling. In order to use the “Route” feature, I plotted a route with Magellanï¿½s MapSend CD and uploaded the route to the Meridian Platinum. I then activated the route and followed the Road screen. The Road screen displays a representation of a road, including upcoming turns. Provided I marked a waypoint at each turn, the distance counted down to that turn. I found that these distances were fairly accurate, helping to guide me in the right direction at the right time. The unit maintained a good signal on the console of my car (not up on the dashboard). Testing under conditions of moderate foliage cover showed that the Meridian Platinum held its signal quite well, with a lock on more than enough satellites with at least medium signal strength. PC cable is difficult to attach. Batteries must be removed to access memory slot. Compass unsteady at speeds under 6-10 MPH. Holds fix well under heavy foliage and in vehicles. 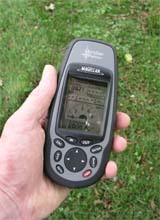 The Magellan Meridian Platinum GPS receiver is one of the few handhelds with a barometric altimeter. It has an SD slot allowing for expandable memory. A slight drawback is having to remove the batteries to access the SD slot. With its larger buttons, many will find it easier to use. If your activities can accommodate a little more room for its larger size, you can benefit from its larger screen, quadrifilar helix antenna, and many other features. Additionally, Magellan’s technical support is available by either email or toll-free phone number and I have found them to be very courteous and helpful.